A friend asked some help with an HR assessment spreadsheet he had to fill in. This spreadsheet was intended to prepare the budget for next year raises and bonuses. In one of the columns, he must write if the person was underachieving (C), on average (B), or above average (A). He obtained the following result: 11 A, 15 B et 4 C. The next instruction was to split the people equally into those categories (10 for each in his case). So 1 person in A should go in B, and 6 from B should go in C.
The problem was that the budget will probably be reduced for the people in B and C categories, and he will have some troubles to give compensations according to his own evaluation. Moreover, he wanted to have a transparent evaluation system to help the skills development of his team, and he anticipated that the transparent system would reveal the iniquity of the system. The trick was there, calculate the global budget needed for the team, and twist the information in the spreadsheet to obtain the budget. The initial intent of “human resources” to anticipate compensation problems that could lead to people departure is good. The initial intent to encourage the managers to assess the skills of their teams is also good. But the instruction to divide the team by third leads to falsification. Combined with the idea of a fixed budget for the year it can leads to numerous other problems. We can design another system where the budget and individual assessment are two different things. Some companies decide to allocate a part of their results to raises. They compare the compensation and benefits of their employees to others in similar industries. And then, they will decide the evolutions according to those datas and people desiderata. (Poult goes further with a compensation committee… I will write something about it in the future). I experiment with a team a system that combine a self-assessment and a peer-assessment. There were only three criteria: Technique, Method and Behavior. Each team member evaluate himself and the other team members on a scale from 1 to 10 for each criteria. He indicates in comments the observables facts sustaining his evaluation. Those comments were reviewed with the manager and the coach to improve observation and feedback skills, and to reinforce the team talent development ability. Then, each team member reviewed all the evaluation collected with the manager and the coach, defined one or several improvement actions that were displayed on the team board. An improvement time was allocated during each sprint to each person. One of the team member was known to react very negatively to some news affecting the product development. All the team was down in a negative spiral and experienced troubles to get out of it. This exercise helped this person to be aware of her behavior and the effect on the team, she asked for help to other team members that should told her if it was happening again. The first time I hear one of the team members, rather shy usually, ask her: “How could you view this differently?” I feel that we were really starting to change. Header picture is from Wikipedia. 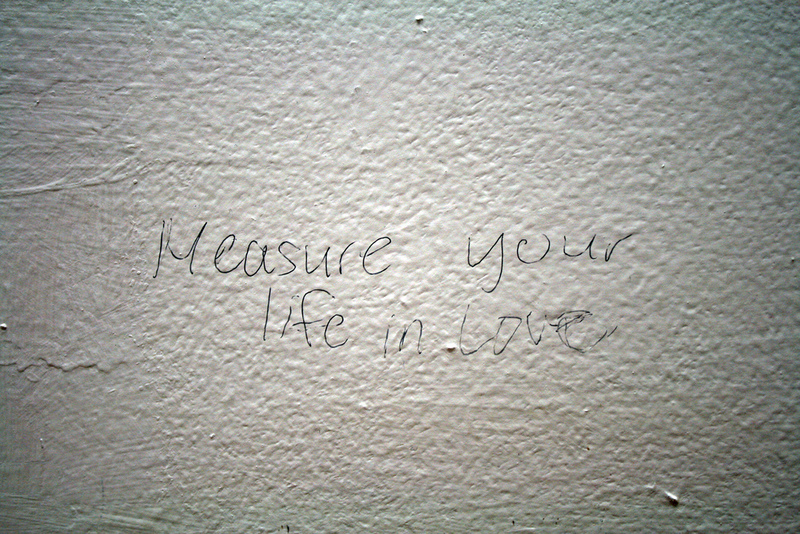 Picture “Measure Your Life In Love” is from Quinn Dombrowski (Creative Commons). L’idée de Kaizen, est de publier un magazine permettant de diffuser des idées positives pour permettre de changer le monde pas à pas. Ce magazine existe depuis 3 ans et réuni une petite communauté de 70000 lecteurs. Le projet de financement auquel je vous invite à participer permettra de financer ce nouveau Kaizen.